Fresh produce and French cuisine go hand in hand. But where can you find the best stuff? Let’s talk French food. Real French food, and real French food experiences. Imagine this: you wake up in your cozy Parisian apartment, you walk into your kitchen, put on the coffee or tea – and BAM! You’re hit with the realization that, except for the end of a rock hard baguette…you don’t have anything to eat. No judgement! I very often find myself in the same predicament. This is just what it means to be really French. Lucky for me (and you, on your vacation!) Paris is crawling with open air food/farmers’ markets. These markets are prime places for you to explore and stock up on the yummiest and freshest produce imaginable! My favorite 5 must-see markets in Paris are below. The rue Mouffetard can really better be described as a ‘market street,’ not necessarily a farmers’ market. However I absolutely need to include it on this list because it’s one of my absolute favorites in Paris. The history, the produce, the small old shops… everything rolls into one beautiful package. In fact, all of us here at Sight Seeker’s Delight loved it so much that we built our Tickle Your Tastebuds tour around it! We think you all know by now, dear readers, that we are loud and proud history buffs over here at Sight Seeker’s Delight. That’s one of the main reasons we love the rue Mouffetard market so much. This little street was a part of the original Paris (waaaaay back in the day when it was still known as Lutece). If you’ve been on our Secrets of the Night tour of the Latin Quarter you of course already know this! The name of the street, Mouffetard, comes from the French word ‘moffette’, which back in the day meant smelly. Oh yes. You read that right – essentially this translates to ‘Smelly Street’ in English! Don’t let that scare you. Why on earth would someone name a street this way? For a long time this road was one of the dirtiest areas of Paris, simple as that. In addition to the market stalls for food, tanneries, dye works and fish shops used to be based here. Things got very, very messy. Opening hours vary since each shop has different hours, but generally the shops will be up and ready for business by 10am (yes, it’s France and we don’t like to get up early here!). Many shops take a sizable lunch break from about 1pm-4pm (again: France). Most shops are closed on Sunday afternoons, and all are closed on Mondays. You surely know the story. The Place de Bastille in Paris is known around the world as the locale of the famous ‘Storming of the Bastille’ during the French Revolution. It was a huge part of the Revolution… and this market lives up to its name. 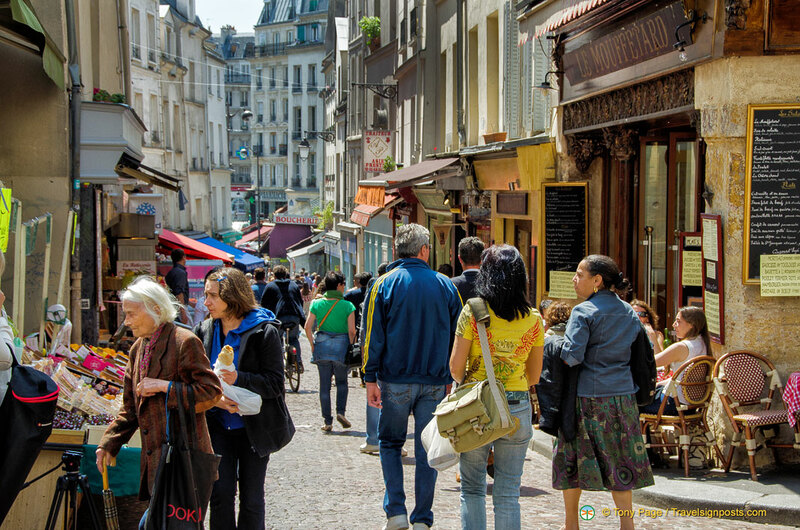 It’s proudly considered one of Paris’ largest markets. I just love strolling through the stalls, drooling over the delicious smells and sights. This market is most known for its size and…its amazing cheese selection. Need we say more, fellow cheese-lovers? On Saturdays the food market gives way to arts and crafts. Once a week, the market is transformed into Le Marché de la Création Bastille, and it’s a great place to find unique pieces of art, jewelry, and clothing. I am a huge supporter of local artists and artisans, so color me thrilled that there is an entire market dedicated to them once a week! Le Marché de la Création Bastille: Saturday 10am-7pm. We couldn’t have a list of must-see markets in Paris without including this gem, even if it is well-known. This is THE oldest covered market in Paris, dating all the way back to 1628. The market not only includes stands filled with the freshest produce, but there are quite a few restaurants inside as well. Can I be honest with you about something? Sandwiches in France are better. There, I said it. Sorry not sorry! The market takes its name from the 16th-century orphanage located where the modern day market now sits. The children that lived in the orphanage wore red clothing, and that’s where the name enfants rouges (red children) stems from. Yet again, the poetic-sounding French name simply boils down to a very literal, sort of boring reason. The orphanage closed not long after the French Revolution, but in 2000 it was revamped into the market you can visit today. Organic produce lovers, we know you’re out there, and you also love coming to Paris! Well we’ve got the place for you at the Raspail Organic Market, located in the central 6th arrondissement. This one’s only open once a week, so mark-et your calendars (ha!). Yes, it’s true: France has also not escaped the world of chemicals sometimes used in agriculture! If eating organic is something that’s important for you, this is a great place to do your shopping. This market is known in Paris as being chic and is a favorite for French celebrities – word on the street is that Jane Birkin is known to frequent it! This market is another one of the older ones, it opened in the late 1700s! This covered market is contained in 3 beautiful halls which are guaranteed to impress any architecture lover. In addition to the food stands, there are also places to grab coffee, and tables to sit and chit chat. In addition to it’s delicious food products, this market also features a smaller flea market section. One of my favorite things to do on a Saturday afternoon is wander around, looking at the interesting clothing, records, books and other antique offerings. If you’re interested in a Parisian blast from the past this is the market for you. The Place d’Aligre was once the home to barricades during the French Revolution and also during the Paris Commune in 1871! Tuesday-Friday 9am-1pm, 4pm-7:30pm. Saturday 9am-1pm, 3:30pm-7:30pm. Sunday 9am-1:30pm. This is a great list – now you just have to get cooking like a real French pro with all that wonderful produce. Have you been to any of these markets? Did I miss one you think I should add to the list? Let me know in the comments below, and in the meantime, happy shopping! This entry was posted in Food & drink and tagged cooking, fruits, market, organic, produce, vegetables. Bookmark the permalink.